Two things, Service and Delivery - Halo offers more than just a great user friendly business analytics/intelligence solution to our business. Halo has an admirable ability of being able to gauge into our business requirements and promptly offer the intended solution. I can vouch that all our previous business transitions were made easy by Halo as the service itself, tells that their massive impact given that their strong approach in a Customer focus nature, we value so dearly. Altus NZ Ltd has recently undergone a Joint Venture in the previous year and it is with great excitement that we are implementing to expand our Halo product to cover all our industrial and sales department throughout the business. The people of Halo have been very attentive in our requirements and are consistently capturing our vision whether if it is dealing with our IT infrastructure, Applications or Sales and management departments. The technical and customer support team will always approach with tremendous efforts in offering great solutions. The presales support was first rate! What other company will give you a proof of concept using your data before you sign any contracts! After the sale the support and contact did not drop off and a team member is always in contact making sure you are happy with the solution. The team is also genuinely interested in your feedback in terms of making the solution better and more effective - they WANT information to in turn help their development efforts. Training was very effective and the trainers have been wonderful. They are easy to follow and the manual and instructions have been written well. You will find that data visualization is easy and you can SEE what your data is doing. We do wish that formatting was a little easier or there were additional options for formatting. The learning curve can be a little steep on the backend, especially if you do not have a dedicated technical resource. Be sure you are ready to take that on or have Halo set up that structure for you. Do your homework and ask lots of questions - but let Halo show you a proof of concept! It is amazing and you will realize what you are missing in analyzing your data. Know that the same support and commitment you receive during presales does not stop once you sign your contract - you will receive the same support months after! We are looking for anomalies, exceptions, and trends instead of just browsing an excel spreadsheet of numbers. It is easy to see where issues lie and drill into those right away. "Halo has unlocked the data around our organization." While the visual front end is very easy to use and powerful, I do wish we had a little more formatting control. Especially around exported visuals to Excel or PDF. I would like to see a one page dashboard print option to give quick insight to users not wanting to dive into Halo. Halo offers the complete package. From the backend date warehouse, Data cleansing, Cube Creation, predictive analytics, and a slick visual front end. If you don't believe me have them do a proof of concept with YOUR data! This is something most other vendors will not even entertain. What better way to show value from your BI software than to evaluate it with data and metrics you know. Do your homework and call references, Halo gets nothing but positive praises from anyone I have talked to who uses it. With Halo we are able to quickly and easily analyze all areas of our business. From Revenue to Inventory Halo has allowed us to leverage our ERP data and take action. We are looking forward to continued benefits that can be gained through knowing and understanding our business through data and business inelegance. "Halo Provides Management Tools to Focus on Important Items"
Halo provides a quick visual on what issues management may want to investigate further. I really like that Halo provides an easy to understand interface that allows each user to quickly look at specific data they need without having to request from IT. I really like the ability to go back in time and look at specific activity. The Halo team have been super responsive and supportive. They have excellent follow up and are very knowledgeable about business processes. The dashboards and view we used with a previous product were more of a macro view, while Halo allows us a more precision view into our business environment. We are able to utilize the information Halo provides in order to make business decisions quickly. There really is not much I do not like. It has been easy for each of our employees to use. We replaced our existing dashboards with the Halo product. The Halo dashboards are much more extensive and relevant. Each department is able to modify and update their dashboards and then share with other employees. It has been a great collaboration tool. We have realized several benefits including a reduced workload for our IT department on information requests. Our leadership team feels more empowered now to be able to drill down and view data on their own as the analysis drives them. "Many databases, formats and issues "
Our previous platform died and we had Halo up in running in no time at all. Comes preloaded with adaptors for many systems like our ERP and CRM which made going live easy. Halo also offers more than just BI, but also predictive analytics and forecasting. There's not much to dislike, but they'll need to continue address PowerBI and how they will play with it in the new Microsoft 365 environment. They are a great team of people. The sales and support team have been the same team as the ones we first dealt with over 5 years ago. Easy access to key data, quick to market with new reporting and dashboard requests from the business. Helping us achieve a single source of reporting truth for our business. "Halo Prism as a Data Visualization Tool"
The ease of view creation is great, once the initial learning curve has been overcome. The speed of loading the views is good, and the filtering of the data sets is generally easy to do. The UI is constantly improving and the HALO team appears to be making good strides towards making the UI easier and more intuitive. The learning curve for understanding the views; that icons don't indicate the same type of meaning (ex. a menu-looking icon can indicate a menu or a select-all action) or that they look similar to standard icons but do different actions. Upgrading versions always seems to come with some extra headaches. Additional setup required to use the mobile app appears quite intensive. Good tool to visualize Analysis Services cubes; Administration is a bit on the tough end. We are able to effectively visualize the data in our SSAS cubes for many roles within our organization. It is an effective tool for data discovery and analysis. "Halo is our answer for dozens of daily business questions!" Pane sizing - views with a lot of measures run out of real estate. Time Dimension response when changing from saved view default. Halo is a great reporting and business decision making tool. Choose Halo! Every day we know where our sales are to budget, what the GP% is, for all 7 companies in our organization. We know inventory levels, customer service levels, vendor service levels. Drill down - through capability allows us to pinpoint areas of concern quickly. "Great solution for predictive analytics"
Halo BI is a great product for a number of the customers we work with. Specifically the predictive analytics for the retailers. No complaints so far. We solution it for a number of our customers. Evaluate as many BI solutions as possible. Halo BI is a great product but you want to make sure to know what else is out there to be sure its a great fit prior to implementing. Visualization of the data and the data warehouse acceleration tool. It partners well with PowerBI to quickly see the metrics that are needed. Support requests are always answered quickly and efficiently. Techs really know the product well and are able to resolve issues easily and really care about the outcome. Login emails are required to be from a set domain, rather than our domain. The support offered by Halo really sells this product. having a responsive and involved support department is paramount with any technology investment. Sales and resource monitoring for our distributed sales and marketing teams. Sales people have their performance and customer sales data at their fingertips worldwide. "Halo GW dramatically reduces time and cost of datamart and cube delivery"
That it is easy for a non-coder to use and the SSIS packages and MDX it generates are rock solid. It means an architecturally minded business analyst can produce a data warehouse and cube quickly without an expensive technical team. Highly recommend Halo. The software is outstanding as is the quality of support. We analyze everything from sales to operations to finance. More accurate information. Reduction of reduction of "dump and crunch" time spent by knowledge workers. "Great product and support "
Ease of use & accessibility, backend support is excellent. "Benefits it gives to our company." It very easy to use, edit and arrange to what is most import to view in your primary dashboard. I like that we can customize our pages to what type of reports we want to see and create other tabs to make them unique to department and sales. I like that we can export reports and filter certain details of what individual vendor has dropped from our buyer's section or increase their buying from our company. The friendly dashboard has made many users become very good at creating all kinds of report and chart sections and downloading them for their monthly meetings. At this moment, I have not come across any dislike for the type of usage I am doing in Halo. They should consider Halo if they plan to have BI software help them he manage their sales profit revues, company profit increase or decrese, logistic cost or savings, and so forth. At this moment, our programmer is just tiring to finish all the request every department has and inputting it in each department cube. From what I know some of the requests that are given to our program to setup in our Halo dashboard are quite complicated. Therefore many users don't like that there request are no up to what they wanted. I know some of the requests other departments have are more complex than ours. But they are working with one of the Halo technical that comes to our company once in a while, to help with the coding in the cube. "Responsive Support & a Reliable Tool." Title says most of it. It's reliably up and working whenever the end users need to use it. if I have any issues the support team is great at helping troubleshoot. I can safely assume any issues I receive from users are likely due to human error. Often, when buying additional features, the customer seems to be responsible for testing to make sure that the new integration or feature is functioning as intended and has not broken any existing feature. This puts a burden on smaller teams who support multiple applications. Build a list of requirements in terms of reports you would like to see. at the very least understand what your measures should be. We use Halo to manage data created by our ERP into manageable and meaningful snippets that individuals can use in their day to day tasks. Currently this is used by Sales, Production and Purchasing with more to come. "Halo BI Continues to Improve and Compete"
Halo DW enables the easy consolidation and manipulation of multiple data sources. Recent improvements in the Halo front end show their dedication to applying their resources toward maintaining their competitiveness in the marketplace and making the evaluation of Halo with others very competitive. The look and feel between their front end tool and others takes some getting used to but the difference is far from obvious for the casual user. You have to dig deep to start seeing differences. Halo provides the single version of the truth and enables easy, user friendly access to the information. Information is now much more easily accessible and consolidation of multiple sources is more convenient. WE've been able to leverage a number of the features in HaloBi. This allows us to better track our data to help individuals make better decisions. lack of integration, however they are getting better about it. Getting off Excel spreadsheets that had numerous people updating. HaloBi allow for us to create a central point for all data and didn't require people to pass along an spreadsheet. The Halo team keep refreshing and enhancing their product. They keep looking for new ways to add business value which continues to support our licensing investment. The tool is so easy to use that training and adoption is no issue. I wish there was more detailed online resources for building cubes and other more detailed parts of the product. Understand exactly what you want prior to purchasing and implementing. Verify it can all be done with your existing data. We are using the tools for an executive dashboard. Its great that there is a single version of the truth out there and that the team can access via mobile on-demand. "Fast implementation, continued improvement on both back end and front end solutions. " Easy to connect new data sources. Support is quick to respond. Genuine desire to improve the product to current standards. Desired functionality in Halo may not be currently available. Financial reporting - Sales insights across multiple data sources - increasing visibility into Operations data. Our greatest benefit thus far is the immense amount of time saved by building an efficient data structure. "Great Data Discovery tool "
Features like "Download" on the dashboard is not flexible enough - For example - we cannot download a whole grid. Define the business process one is trying to solve first. Also , it is very important to understand all data sources , business rules to prevent rework. It is important to have flexible and dynamic back end queries. "Easy to develop and implement, continuous improvements and well supported"
The capabilities, flexibility, and accessibility of the software are excellent. Using templates to create dashboards make it easy to incorporate into our business. On-premise only means cloud data sources must be replicated locally. Test the tech support for this and competing software. 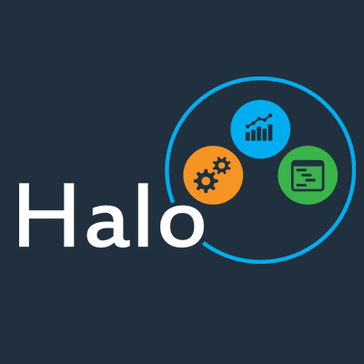 We use Halo to communicate KPIs and business status information throughout the company. "Online BI Dashboards Made Easy"
GUI tools make simple transforms easy, while ability to use SQL directly gives you plenty of power. Technically, everything you can do with this software could be custom rolled by programming all of your own extract scripts in SQL Server and your own web dashboard, but it would almost certainly be less quality and cost much more. If you have not worked with other similar technologies there is a learning curve that can be a challenge to get over at first. There is often more than one way to accomplish things, but sometimes there are inconsistencies in what is available and when. Provide up-to-date analytics available across the company to provide a more centralized "truth". Before this we had everyone working with their own spreadsheets and dashboards. So far I have not found anything that I dislike about Halo! "Halo is a great tool for our users to analyze our data"
The user interface (known as Prism) is very user friendly and easy to navigate. Once a user watches a few videos that we've created on Prism they take it and run with it. And their support team is extremely helpful in answering any questions our users might have. There's not really anything that I dislike about Halo. We have developed about 20 cubes covering various areas of data for our organization. The views built on these cubes allow our users to monitor different trends as well as financial information very quickly. The product is great and the r service and programmers are second to none. Like the on-shore. Make sure you have a good DBA that knows your data structures inside and out who can work full time with the Halo installation team. It is easy to navigate and add different data elements - drilling up or down to get different perspectives on the data is great. This is a great tool that I utilize daily. We just need to build out more data cubes! Halo is great product and you should absolutely consider it when evaluating a BI tool. We haven't looked to solve any problems, yet, but I believe this tool will help us to see areas where we can focus for various objectives. The biggest benefit is being able to change the perspective or data elements quickly and easily without having to create separate reports. "Great solution for data analysis and reporting"
The reports design are clean and the scheduling feature makes it very easy and handy to share information across the business. I wish Halo could build cross tables reports as well and had a more approachable language to build formulas in calculated fields. Multiple source of data would cause confusion, sharing and seeing the same data is a great benefit. "Halo enables end user to pull their own custom reports"
Allows end users to pull their own reports. The designer training digging in to the data visualizations that are available. Views can often be slow to load and there are many settings and HaloDW options that are not intuitive that need to be configured to increase performance. Visualization of data and pulling data that is useful for clients to make business decisions. Simple to learn, easy to understand functionality, users can begin using quickly. Disparate cubes, all info should be linked, in my opinion. We are able to provide Sales with decent Sales analysis, by product, region, customer, etc. Easier access to this information and reports. "HALO: Exciting way to share passion for analytics"
I like the ability to easily edit panes to create targeted analytics. One thing I wish I could do on the front end is be able to connect cubes to create more meaningful analysis. We are using it to review trends in different areas of the business. We are driving culture change in regards to data-driven decisions. The ease of use in creating your own dashboards. Dragging and dropping makes it very easy to create your own dashboard . Wish we had more formatting control. Depending on the data being selected the presentation can be very slow or even lock up. Gathering of data from current ERP system takes time and possibly custom reports. Halo gives us the ease of use to get the data ourselves. "Never a need for a second look..."
People, the company and the product delivered as advertised. During our evaluation process we were able to see the product in use with our own data, they call it the "72 hour proof-of-concept challenge". The consultant who worked on the POC was the same who did our implementation, it wasnt like they sent the "A team" to close us then we get the C team fresh out of school for our implementation. Length of time to actually commit to position ourselves for a better future. To much internal red tape. Inventory, MRP Process, flow planning to the shop floor based on historic data. "Good tool for analysis and decision making"
Good for any size of company, easy to implement, Prebuilt for ERP / CRM, Prebuilt templates for our industries and for our clients. Didn't find a problem. Fulfilled every need of the business. We are now able to get a complete overview of our business health with access to information in just a few clicks. Halo's reporting and analytics also resolved internal staff issues with the information we have acquired. I think source has been great for easily building cubes. Support is top notch as well. My lack of training when it comes to source. I feel like I could benefit from an advance source class. Pulling National procurement and sales data across all 13 regions. "Very useful tool - really glad we have it. " The relative ease and power given to the user to create custom data searches and formats of numbers. I can customize report with a great amount of ease. I find it is not as flashy as some other programs. I find as a numbers guy, it is great. If you want the visual splash, I tend to not use it. Ease to evaluate lines of business, history of accounts, trending on key data. We have given sales the information to present with customer to increase prices based upon customer's not living within the sales agreements. Halo is great for those who have more to do than just BI. Halo is easily managed. Halo has given me the ability to put data in the hands of users without me having to write numerous reports. "One Stop Shop for ETL, BI, and Analytics." I enjoy the ease of the product. I can incorporate any data source I have come across and load it in and have a visualization create in a matter of minutes. Additionally, I enjoy the advanced features that allow me to tweak and optimize my ETL processes. Definitely good for any size company. "Great for simplified ETL processes"
Halo Source simplifies the underlying SSIS and SSAS processes and improves them rather than taking away. "Easy to use management tool"
The product is easy to use. The graphs are very easy to create. You can customize views very easily. Transfer of knowledge and ability to utilize the product without having a deep knowledge of coding. Seems like with every version update of Halo, there is something that breaks. Usually get corrected on next update rather then a patch of the current release. Clear presentation of many business data located in an easy accessible portal. "Halo is a user friendly interface to critical business information formatted in an efficient manner." The efficient way data can be formatted and presented. By doing this, the user base can vary from tecnically savvy to occasional users. When very heavy transaction based data is presented in a grid, it can get slow. Do a thorough evaluation of what your users require. The primary use for Halo at our organization is sales analysis. Complexity of backend ETL processing. Creating the ETL jobs/projects for the Dimensions and schema and processing could be simplified. "All of my data in one quick view"
The easy way to change forms of data analysis. .The tool has its complexity but it depends on my study. Halo provides us with beter visibility into our entire operation. By combining several data sources we are now able to clearly visualize our data and take immediate action when needed. I think it is great how easy it is to slice and dice info. It really allows me to analyze the business. Would love to see it as a forecast tool as well. "HaloBI has changed the way we look at data, analyze the data and report data to our clients." Would like to see more mobile functionality. Our managers have seen views of data that has shown them issues they never knew they had. * We monitor all Halo reviews to prevent fraudulent reviews and keep review quality high. We do not post reviews by company employees or direct competitors. Validated reviews require the user to submit a screenshot of the product containing their user ID, in order to verify a user is an actual user of the product.